Authorization to Attack: What Does the Constitution Say? Congress is debating whether to approve the use of force against Syrian President Bashar al-Assad’s regime in response to its use of chemical weapons contrary to international standards. A military strike would be momentous enough, but this debate has also become the occasion for an important national discussion over the role of Congress in directing American foreign policy. Let us point out up front: This article is not designed to say whether or not the United States should attack Syria in response to its use of chemical weapons against its own people. We are, however, making the case that, regardless of what the President decides to do, he should seek authorization from Congress first and abide by its decision, even if it is contrary to his plans. Only a handful of lawmakers have supported action against the Syrian regime, raising the question of whether the President will even find the votes necessary for Congress to approve the use of force. In the face of this opposition, the Obama Administration maintains that he has the authority to act regardless of congressional disapproval. During his trip to Sweden, the President said, “As commander in chief I always preserve the right and the responsibility to act on behalf of America’s national security. I don’t believe that I was required to take this to Congress.” Since relatively few lawmakers have supported the strike, many have been wondering: Would the President have the authority to launch an attack without the formal support of the legislature? It seems strange that there should be a dispute about something as momentous as who retains the authority to launch military strikes, but the Constitution allows for such a discussion. It divides responsibility for military actions between the Executive and Legislative Branches. On the one hand, the Article II creates the President the “Commander in Chief of the Army and Navy of the United States.” On the other, Article I invests the Congress with substantial powers over the military, the most notable being the authority “To declare War…” Questions over who ultimately retains the authority over military decisions, such as the one to attack Syria, are practically unavoidable. In trying to flesh out the question of whether the President can act without Congress, a few sections of the Constitution appear crucial in providing an answer. The first is Article II, which creates the Presidency. An important feature of the Constitution is not only that it establishes offices, but also clearly grants particular powers to the officeholders (e.g., the House of Representatives has the authority to originate taxing legislation; the President nominates judges; the Senate ratifies treaties). The Constitution designates the President as Commander in Chief, but the specific powers proper to this role are not enumerated. Rather, the Founding Fathers simply agreed on the laconic language: “The President shall be Commander in Chief of the Army and Navy of the United States, and of the Militia of the several States, when called into the actual Service of the United States” (Article II, Section 2). It is too much of a stretch to simply infer from the grant of that office that the President has the power to launch attacks without the support of Congress. Although the Constitution does not elaborate on the President’s exact powers, one thing is clear: The President does not have the authority to declare war without congressional approval, since Article I, Section 8 grants the legislature this power. Thus, those who would grant the President the constitutional authority to attack without congressional approval in this and other situations would have to argue that the document anticipates both wars and other types of military actions. In fact, the document lists several other armed conflicts: “Insurrections…and Invasions”, and “Rebellion”. These other kinds of military events differ from wars insofar as they are all instances where the country is suffering some attack rather than initiating it. (War can in fact be instigated by an attack, such as World War II, but this is not always the case.) However, the Constitution does not explicitly say who should direct the response to these attacks. This is somewhat ironic, since the need for the Federal Government to be able to put down future insurrections, such as Shay’s Rebellion in Massachusetts, was a constant topic at the Constitutional Convention. James Madison’s notes from the Constitution offer insight into which branch of the Federal Government would set military policy. Madison and Elbridge Gerry apparently endorsed the proactive-reactive attack distinction made above, since they moved to use the word “declare” for Congress’ power, removing “make”, which then freed the President to “repel sudden attacks”. Furthermore, when one delegate suggested giving war-making powers to the President, Gerry objected that he “never expected to hear in a republic a motion to empower the Executive alone to declare war.” Mason further argued that the President alone should not be allowed to make war since he was “not safely to be trusted with it”. The Founders’ pervasive fear of strong Executive suggests any power to initiate new strikes should remain with Congress. We cannot find sufficient evidence to justify the conclusion that the President may proactively attack another nation without the approval of Congress. President Obama’s change of heart shows that the adage, “Where you stand depends on where you sit,” proves true in politics as in the rest of life. Those sitting in Congress have a very different view of their prerogatives than does a person sitting in the Oval Office. It is not unlike how a Senator will oppose the use of the filibuster when in the majority, but support it when in the minority. If the section of the Constitution treating the President as Commander in Chief does not plainly permit him to launch an unprovoked attack without congressional approval, one who would argue thus must infer it from somewhere else in the document. However, the overall sense of the document gives a certain primacy to Congress in setting national policy, suggests that it is fitting that the legislature must approve an unprovoked attack. For instance, the President is forbidden to take actions without Congress that are far less momentous. The President is Commander in Chief, but Congress is granted the power to “make Rules for the Government and Regulation of the land and naval Forces” (Article I, Section 8). Presumably, matters concerning military regulation are generally less important than the decision to launch an unprovoked attack, so such decisions should probably best be left to the Legislature as well. Likewise, the President is considered the chief diplomat, but any treaty he negotiates must be approved by a two-thirds majority of the Senate. Similarly, he ordinarily requires the consent of the Senate to fill his cabinet—the only exceptions being when the Upper Chamber is unable to fulfill its duties. Yet, normally, military action would be far more consequential to the welfare of the nation in general, and certainly to the soldiers in particular, than any treaty or cabinet appointment. It stretches credulity to suggest that the Framers would approve of the President initiating, without congressional support, an action more consequential than that of a treaty or cabinet appointment. After the Constitution, statutory law offers some justification for the claim that the President has authority to launch a strike without Congress. Right now, the most important law to consider would be the War Powers Resolution (WPR), which Congress passed in 1973 to assert its prerogatives over directing the military. In Section 2 of the WPR, the Congress acknowledges it does not have absolute power over the use of military force. It was passed to “insure that the collective judgment of both the Congress and the President” will be exercised when the country faces the decision to use force. 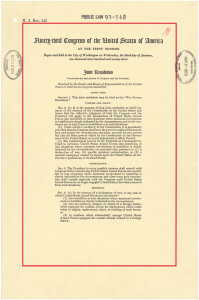 In subsection (c), Congress lists three situations in which the President has “constitutional powers” to use military force: pursuant to a declaration of war; to “specific statutory authorization”; and “a national emergency created by attack upon the United States, its territories or possessions, or its armed forces”. The first two situations are distinguished from the last by virtue of the fact that they certainly require congressional sanction, suggesting the third does not. This, of course, is in keeping with the Framers’ intent that the President should be able to defend the country against a sudden attack. Since conditions two and three do not concern an actual attack, they are irrelevant here, but the first does. When the President reports, he must give “the constitutional and legislative authority under which such introduction took place”. The simplest interpretation of this requirement is that, although the President may authorize an attack without the express approval of Congress, he must already be legally entitled to do so. This might be a situation where Congress passes a law that says, “The President may launch an attack without consulting Congress in situations X, Y, and Z; the President has the discretion to determine whether these conditions exist.” If there is a public law that provides the president with carte blanche authority to launch any small-scale attack he deems necessary, we are unaware of it. Not to be left out of the debate, the Supreme Court did limit Congress’ ability to restrain the President’s use of the military. 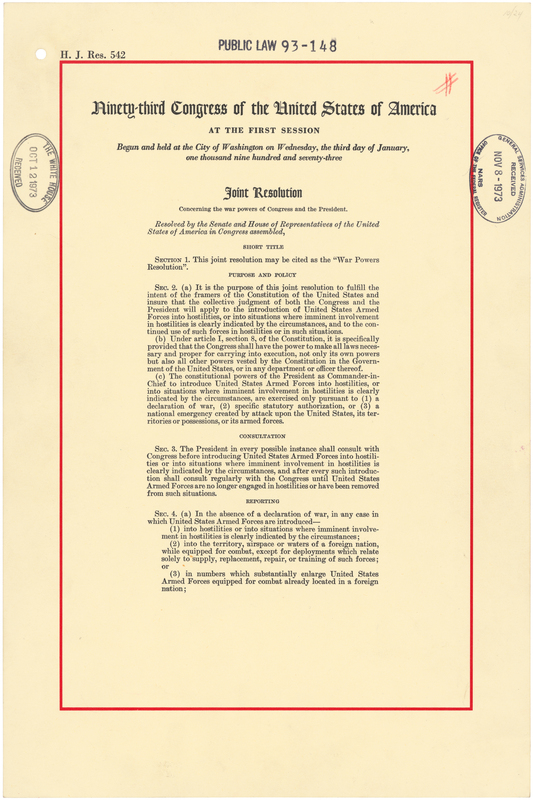 The War Powers Resolution as it originally passed granted Congress a legislative veto that would have allowed it, by a simple majority vote of each Chamber, to force the end to a military incursion after 60 days. However, the Supreme Court ruled in INS v. Chadha, that such a legislative veto was unconstitutional. The War Powers Act, although not ruled on directly, was then amended to require a motion of disapproval that would have to be signed by the President, who would veto it in all likelihood. Since the only way to force the cessation of military action is a resolution that the President himself can veto, the Supreme Court effectively required a two-thirds vote by both the House and the Senate to force the President to end a military action – an extremely difficult standard. According to the Congressional Research Service report The War Powers Resolution: After Thirty-Eight Years, the War Powers Resolution has figured in several court cases over the years, but the courts have not directly ruled on its constitutionality. In 1982, a number of Members of Congress filed a lawsuit against the Reagan Administration for sending “military advisors” to El Salvador, but the judge dismissed it on the grounds that it was not the Court’s place to resolve the question of whether the advisors were involved in hostilities. A similar case was brought following the 1983 invasion of Grenada, but the judge ruled that the Congress must use all the means at its disposal to resolve the issue before turning to the court. Democratic President Bill Clinton likewise faced a challenge that the military actions he authorized in Yugoslavia were illegal (because they exceeded the timeframe of the WPR), but the court dismissed the suit on the grounds that the Members of Congress who initiated it lacked standing to do so. Without the decision of the courts on the constitutionality of the War Powers Resolution, the conflict between the Executive and Legislative Branches will continue. If the War Powers Resolution is presumed to be constitutional, the President should abide by it in Syrian situation. As indicated above, the only situation where the President has the constitutional authority to order armed forces to engage in hostilities without the authorization of Congress is “a national emergency” when the country has been attacked. Although the Syrian regime used chemical weapons contrary to international standards, it did not do so in an attack against the United States; the President has also conceded that the country is not in immediate danger. Furthermore, since the WPR presumes that absent constitutional authority to launch an attack, and since we are not aware of a law that provides him with the general authority to launch small-scale attacks, strictly speaking, we must say that he would not be allowed to do so without the Congress’ approval. So under the terms of the War Powers Resolution, the President is not in a situation where he may use force if Congress votes him down. Strictly speaking, for better or for worse, is not practically speaking. The way history has played out since the mid-20th century shows that the issue is murkier than a dispassionate analysis of constitutional law would suggest. In reality, the Presidents have exercised substantial discretion over when and where to use the military, and the Congress has often acquiesced. The Constitution made it clear that only Congress could approve a standing army, and that Congress could only appropriate money for such an army in two-year increments. It signifies the Founders’ suspicion of a strong military in the hands of a strong Executive—a fear that the American public has shared from time to time. For example, just four months prior to the sneak attack on Pearl Harbor, Speaker Sam Rayburn barely prevented the House from practically disbanding the army by extending the time served by draftees for another 18 months. The move to keep a large army intact passed 203-202! That’s right – four months before the U.S. was attacked by Japan the House came within one vote of dismantling most of the regular army. The world changed, however, following World War II. The United States was now the preeminent world power and the defender of western democracies. It had large standing armies in Europe and Asia. It was confronted with a communist invasion in Korea. Most importantly, the Cold War ushered in weapons that could incinerate the world in a matter of hours and the United States made treaty commitments to our European allies who lived in the fear of imminent Soviet invasion for nearly 50 years. There was little doubt that the President could launch nuclear weapons without so much as a phone call to the Speaker of the House and the Senate Majority Leader and could commit U.S. forces to immediate military action if our allies around the globe were attacked. What’s more, Congress continued to equip the President in this effort through the creation of the Central Intelligence Agency, the National Security Agency and special forces units in all branches of the military, ready to act on a moment’s notice in response to the President’s commands. Whether or not, as a former constitutional law professor, President Obama has recently rediscovered the war powers of Congress, or whether or not the President is wisely attempting to build national support for his actions by including the Congress, it seems very appropriate that he is consulting Congress over the use of force against Syria. However, as of now, it is unclear whether a resolution to strike Syria would pass either or both Chambers of Congress. Should it fail, he ought to respect their decision and perhaps go a long way to reestablishing balance in the Legislative-Executive roles in determining when to commit American military forces into action.